Sir Joshua Reynolds by Reuben Sheppard (active 1906). Cromwell Road façade of the Victoria and Albert Museum, London. 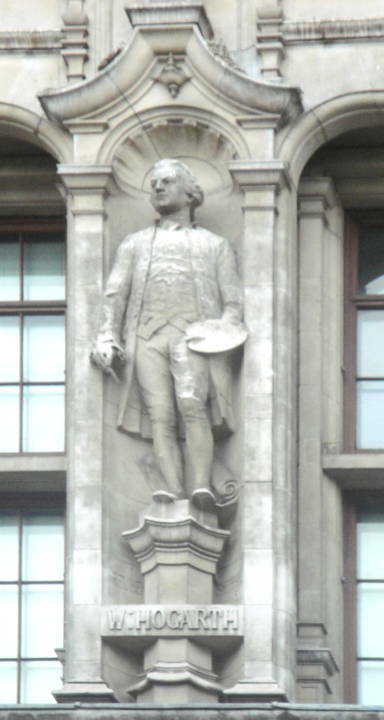 The plinth on which the statue stands proclaims it to portray William Hogarth, but according to the The Times online edition, Robert Simon, an art historian, pointed out the error, which the the museum acknowledged. [Click on images for larger pictures.] Photograph at right and text by Robert Freidus. Photograph at left, formatting, and perspective correction by George P. Landow. Meller, Hugh & Brian Parsons. London Cemeteries. Fourth Edition; Amersham: Avebury Publishing Company, 2008.